Cevdet Erek’s (Turkish, born 1974) practice as a musician, architect and visual artist revolves around sound as a measure for space, time, and the world around us. His new performance and installation for the Art Institute’s Griffin Court, entitled chiçiçiçichiciçi, takes its cue from everyday life, where each sound—a percussive proposal—designates a different movement and a change in proximity to the objects we encounter to produce our daily symphony. Erek integrates architectural elements, musical patterns and rhythms into the space to suggest a pace, to impact how our bodies navigate that space, and to designate our distance or proximity to architecture and sound. chiçiçiçichiciçi is the first installment of Iterations, a series of new performance commissions. The Art Institute of Chicago proudly presents Iterations, a series of seven new performances that stage the wide range of artistic practices and attitudes in performance today. Newly commissioned works by Alexandra Bachzetsis, Math Bass, Cevdet Erek, Ralph Lemon, Paulina Olowska, Cally Spooner, and Evelyn T. Wang—anchored in choreography, sound art, spoken word performance, installation, music, and gesture and movement research—explore how performance is situated in the context of the Art Institute of Chicago, in the museum’s distinct spaces and amid its wide-ranging collection. 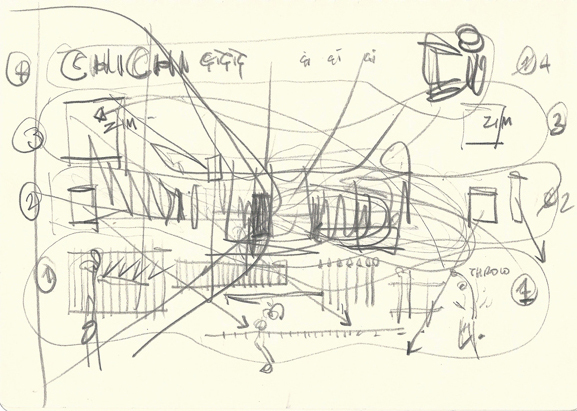 Cevdet Erek, sketch for chiçiçiçichiciçi, 2018. Courtesy of the artist.